Denver Holt will be returning on August 11th at 4 pm PT/ 7 pm ET for another live chat! 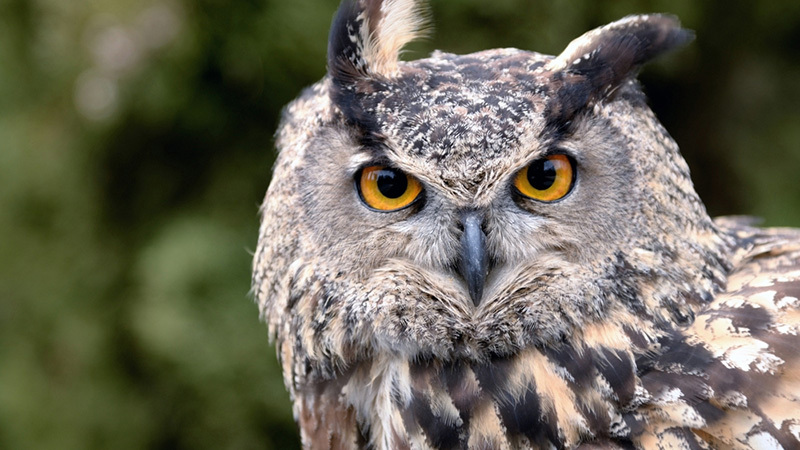 In this chat, he will discuss both owl and osprey related questions and hopes to give you a better understanding of the animals as well as recent events. Please submit your questions here so we can make sure Denver has them before the live chat begins. When we go live, you can watch live here! Is there any update on how the GHO owlets in Charlo are doing? Also I want to thank you again for keeping an eye on C4 when the camera was down! One of the Chatters was able to get video footage of two owls in the wee hours of Aug. 9th. One was in the Nest Tree and you could make out the white necktie. At what age do the owlets develop this? Do they have it at present 14 weeks of age? Has anything surprised you about GGO or their young? Thanks for the work that goes into making the site possible. Is the absence of food begging calls an indication that the Great Gray Owl fledglings are hunting on their own and if so does that mean they will soon be dispersing? Could you please give us your thoughts on things that went on between GHO and Ospreys on cams this year — taking chicks from two nests — Hog Island and ….Luther’s nest (forget where.) Is this GHO predation on Osprey chicks something new? Is their ground prey less abundant? Also, thoughts on Rachel fighting a GHO off at night, several times, to save her 3rd chick. (These next items will likely upset some people, so up to you!) GHO staying right on the osprey nest eating a chick, I thought they typically flew away with their prey? Based on unfinished carcasses at HI, do GHO hunt when not hungry, or were these large chicks just too much for them to eat? If the latter, why go after such large prey? It has to be much harder to get, especially when you have to fight an adult osprey to get it! Thank you for taking the time for a live chat with us! Hi Denver. my Osprey Questions. 1. Was wondering if you could give us your account as to the Osprey Fledgling found in the nearby nest, while the cam was down?. 2. Now that we know Charlie and Charlotte are committed to this nest and most likely will return next year. will you try to do some banding? Hi Denver, my GGO Questions. 1. Do you think the GGO’s parents will used the same stump to lay eggs? if not and the nest elsewhere .. will you move the cam near by the nest? … will you add more cams to any of your sites? or maybe another Owl or Osprey Site in the future?? It is said that unihemispheric sleep has not been found in top predictors such as owls and eagles, but this year was observed in osprey in Rachel protecting her remaining chick from owl attacks. She exhibited this behavior night after night, with repeated success in detecting the attacks. What is you hypothesis for this adaptation as osprey are a predatory species, although not a top predator? Has this behavior ever been observed on the other Explore cameras covering owls, eagles, or the Charlo ospreys? Is there any indication that osprey can see in the dark more than initially suspected? Perhaps on a ultraviolet wavelength or a different part of the visual spectrum? Can a GHO take an adult osprey? The statement was oft repeated at HI chat during July that the GHO could just as likely take Rachel off the nest at night as Bailey. How large of prey can a GHO take? My question is in regards to the Winter Raptor Workshop you had last January and what kind of counts did you get on Raptors? My other question of interest is when were the 2 Osprey platforms installed , regarding the one the cam is on presently and the one about 200 yards away. Do you know if any Ospreys have ever used the other platform 200 yards from the present cam nest? As I recall last season it was stated there were seasons of Osprey and also Great Horned Owls on this webcam nest platform. Thanks for all you have done with the Institute and your much needed Owl research. Dear Denver, I seem to have a nest of Owls close to the house as I heard the familiar clacking of owlets but couldn’t pinpoint them. I wonder, if I ever come across one on the ground, it seems that advice states I should put it higher up in a tree or leave it alone. My question: If I were to pick up an owlet would, for instance, a GHO mom attack me by perhaps flying really close to my head or even land on it and the talons would definitely do some damage since I am a quick bleeder with being on much medication. I read recently that someone had been attacked by an osprey which I would consider the gentler of the two. There are so many geese in the field to the right of the Charlo nest sight. Sometimes you can hear their cries in the middle of the night. My question is; Do the owls find the goose’s young an easier prey compared to the osprey because they are the ones in numbers? In April there are three times more geese than there are now. Two thirds of them disappear in comparison to what there are now. Do you have any idea when and why this happens and where they go? One more thing, please. When the cam was fixed and put back up and going,Tuesday morning, I haven’t seen any more wasp. Did they play any part of the cam going down and were they removed during the process? Do you ever watch the cams? Did you happen to see the viewers list of all the birds, animals, and insects seen at this Charlo osprey sight last year? (AwolTom kept and updated the list) Thank you so much for all that you do along with the Owl Institute and Explore to help bring these amazing osprey and other creatures to us via cam on this beautiful picture perfect land. What happens to the ospreys once they reach SA? Do they stay as a pair or split up til Spring when thy return to nest? How have high temperatures and forest fires in western Montana this year affected owl and osprey behavior? Hello! I have asked this before but it has never been answered. I love the picture of you with the adorable owl. The owl seems so calm. Can you tell us the back story on that picture? Thank you. Hi Denver Holt and all. Incredible web cams! 2questions, are owls really smart and yeah “wise”? Where did that association come from? And how long on average do Ospreys live? Must be a river close by in Montana web cam? Thanks! Do you know at what age the GG owlets develop calls other than begging calls? We are hearing the contact calls and warning calls at night, but don’t know if those would still be parent only calls or if by now the owlets are able to also communicate with those sounds? If/when owlets develop, will tones be a higher pitch/younger sound or sound the same as the parents? Thank you! Has anyone from ORI done any ongoing onsite observations of the GGO’s? We are wondering if there has been confirmation of all 3 owlets to date since we have only seen 2 at a time on camera. Thank you!